The church of the Holy Rosary in the Bronx, New York City, will have a sung Mass on the Vigil of Ascension, Wednesday, May 24, at 7:30 pm; the church is located at 1510 Adee Avenue. Music for this Mass includes plainchant and two original motets by Holy Rosary’s music director, Eva Sze. 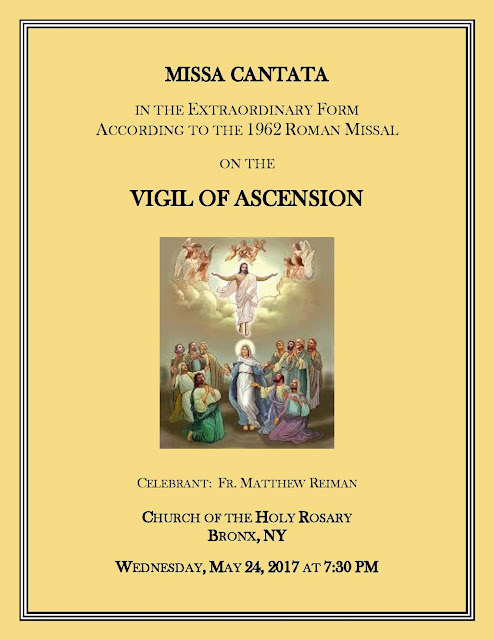 Attendance at this Mass fulfills the obligation for Ascension Thursday; a reception will be held afterwards, to which all are invited.